Nanoscience Instruments, a proud partner of Biolin Scientific, introduces the latest innovation to contact angle tensiometer measurement instrumentation to the U.S. 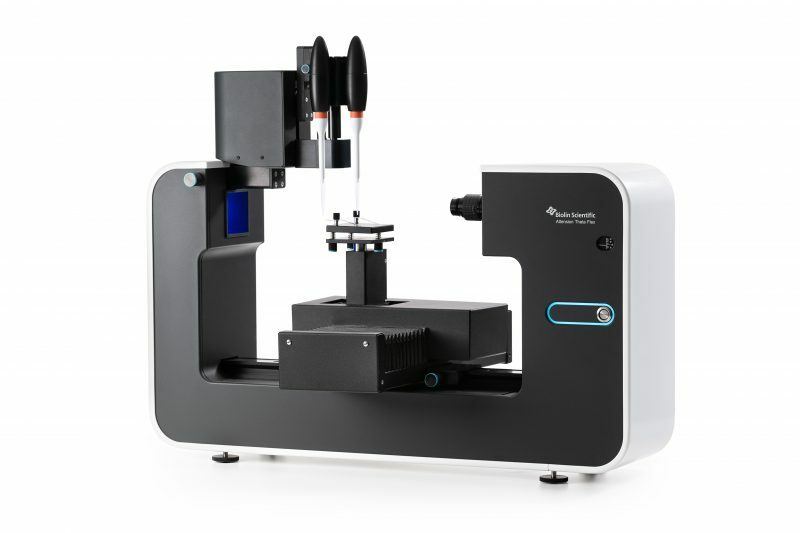 The Attension Theta Flex features multiple measurement capabilities including automatic static and automatic dynamic contact angle, surface free energy, 3D surface roughness, surface and interfacial tension, and interfacial rheology in one instrument. The modular instrument design and easy to use software include all measurements for diverse applications in industrial and quality control. “The OneAttension Software features automated dynamic advancing and receding contact angle that improves reproducibility by removing operator bias. This is an issue when there are multiple users conducting the same measurement,” says Gregory Wills, Product Manager. The new automatic liquid purity check improves contact angle reproducibility and accuracy by measuring the surface tension of the probe liquid prior to each measurement to ensure it falls within user predefined ranges. The innovative software features an intuitive user interface, custom recipe scripts, and configurable multi-user set-up. “Users scan their unique ID and the software loads the pre-programmed measurements. All steps from loading the measurement to performing it and analyzing the data can be automated.” Says Sebastian Kossek, co-owner of Nanoscience Instruments. Attension Theta Flex enables the user to select the level of automation and the advanced functionalities based on the application. The modular design and an extensive range of modules and accessories there is room to upgrade or change the instrument as needs evolve. Nanoscience Instruments is a trusted supplier of the most innovative and highest quality analytical solutions to academia and industry. With installations in over 1,000 labs in the US and Canada, we specialize in surface science, nanoscale microscopy and instrumentation, including desktop scanning electron microscopes, electrospinning nanofiber synthesis equipment, optical profilometry, nanoindentation, micro and nanomanipulation systems, ion milling, contact angle goniometers, quartz-crystal microbalances, portable AFMs & STMs, as well as consumables and accessories for these instruments.